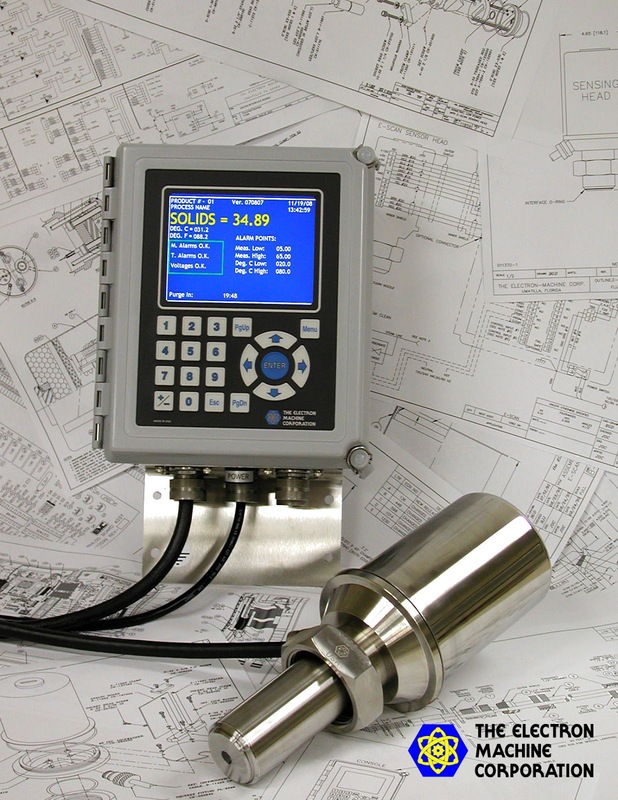 Process refractometers are used for monitoring, controlling, and recording the concentration of dissolved solids in a process media. They accurately measure refractive index and temperature of the process media and provide a visual display in units specific to that process (i.e. Brix, Percent Solids, Dissolved Solids, SGU, R.I.). The MPR E-Scan is a hybrid-digital critical angle refractometer. It is used to measure the refractive index of process fluids and may be used as an error indicator or an integral part of a complete process control system. The MPR E-Scan is calibrated and temperature compensated to your process specifications. It is ready for installation and immediate use when received. Calibration procedures are available to change system parameters and allow the refractometer to measure different process fluids. 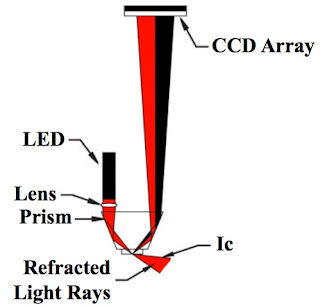 Energy radiated from the LED passes through the prism surface to be reflected off a mirror to the prism-to-process interface. The light reaching this interface intersects the same interface over a series of angles specifically chosen to include the critical angle (Ic) for the process being measured. Light intersect- ing the interface at an angle greater than critical angle is refracted into the solution. Light intersecting the interface at less than critical angle is reflected up out of the prism up to the digital CCD linear array to be scanned. The resolution of each sensing head is maximized by selecting the angle of the prism for the measurement and temperature range of the process. The MPR E-Scan refractometer utilizes a hybrid-digital measurement principle. 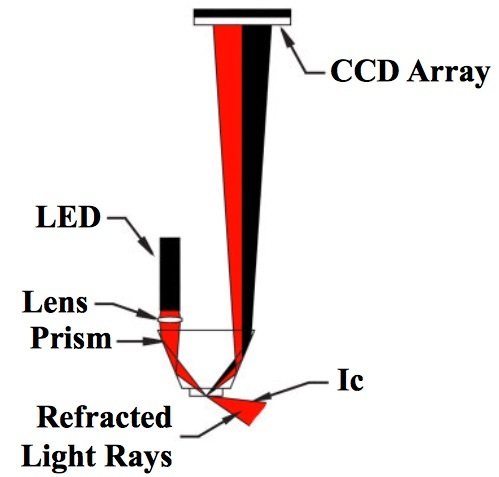 The CCD (charged coupled device) in the sensing head digitally measures the refractive index of the process. Any change in critical angle changes the ratio of light to dark periods. The digital measurement is temperature compensated and converted to a variable voltage by rugged electronic devices in the sensing head. This allows the relatively sensitive micro-processor driven devices to be located in the electronics console where more protection from the process can be provided. The signal is then further enhanced and displayed as a reading in refractive index, Brix, solids, percent, or other measurement unit. This combination of state-of-the-art micro-processors combined with tried-and-true analog components provides a high-level of accuracy along with the rugged dependability required for years of use when installed in harsh industrial environments.